It's an admin panel. Seriously, who cares about color? Functionality is all that matters. Right now we are working on the top panel of mobile view- there are too many elements, we will try to sort it out and make more mobile-friendly. there will be a guideline after we make sure the main concept is fine and we can go to the finish line. Idea is that add-on developers will need to add certain classes to their templates. You are right, we think the same way as developers. But I heard several time already about this feature. The main point is that one can have several CS-Cart stores and different colors of backend will make live easier. I would vote for this. I think only the header area needs to be distinct. It should also be able to be done via a $config['admin_header_color'] or other programmable function. For development sites, we add a 1/4" red banner that says "TEST SITE ONLY". Be nice to be able to have something in config.local.php that would set the header color and then we can overwrite that value on a test site based on subdomain other other test-site logic and no longer use the banner. Let me elaborate just a bit on the need after reviewing other comments. For many of our clients we setup test sites by periodically cloning their development sites so they can do things like import feautres and verify their import files work properly and a variety of other testing scenairos (as well as testing new development we might do for them). So being able to easily distinguish between a test site and a production site simply makes life easier for our clients. For merchants who do not have multiple domains and/or test/development sites, then this is probably unnecessary. But for larger environments that have test/development/staging sites, it would be really helpful. And for merchants that manage more than 1 site, it would almost be critical to avoid mistakes. It's one of those little things (low risk) that can make managing multiple stores (or test sites) much easier while reducing errors. This is awesome! I walked away from CS-cart because of antiquated back-end for vendors. Responsive, modern vendor panel was much needed. I am buying CS-cart today! On the same topic ability change the color to match the front end is also needed. I am voting for it. For a single admin it might be a not a big deal but when you are running multi-vendor, and you have a red/white front end, having blue/white vendor admin seems like a disconnect from branding perspective. You do want to give consistent feel to vendors/sellers. 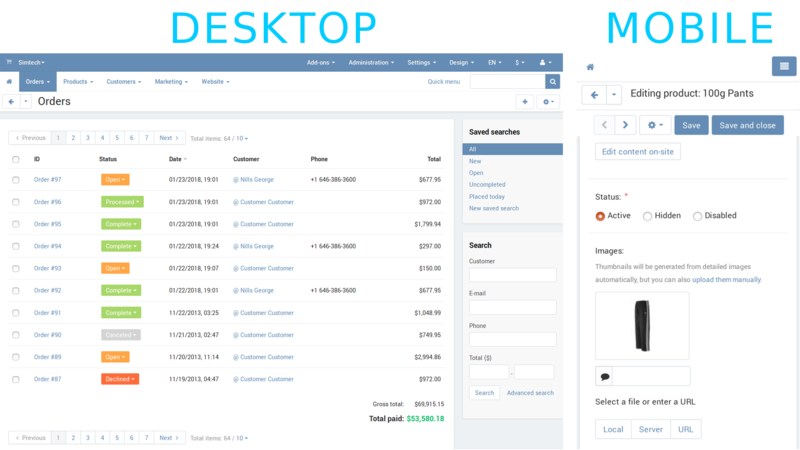 There is chameleon add-on on the marketplace that does exactly that but I am not sure if it applies to vendor admin panels. I cand see it on addons in admin..
Can i download it from a link? We haven't released it on the Marketplace yet, so there is no download link at the moment. As for compatibility, we're aiming at 4.7.1 and newer versions: it means that we only test the add-on on these versions, and if you attempt to install the add-on on older versions, the installation will abort and you'll see a warning that your version isn't compatible. It's a safety measure to prevent people from installing the add-on in the stores where it might not work. Although the version restriction can be easily bypassed, proper functioning of the add-on in older versions is not guaranteed. This using Bootstrap? v3 or v4? It's required to have backward compatibility with add-on that change/add templates in admin area. - Template editor in the admin area does not have a lot of space to view files, this way you are constantly scrolling down to scroll to the right and view the filename. You can test the Responsive theme at dev demos: dev.demo.cs-cart.com/admin.php just install Responsive Admin Panel [Beta] add-on and enable it. new main menu magement is now perfect! only need improve layout magement. - When not hovering over an active menu item the text becomes unreadable (too dark). Where does one set the color for the admin panel conditionally so the same source base can be used for a product and development site with difference in color of site header? 3) Add text to "+", "Gear", "->", "V" signs that are used to add element, see more options, go back, more options..it will be an enhancement form UI perspective. Save button has text but all other buttons have signs, making them all similar will improve usability. It took me a while to get used to "+" and "Gear" signs, they are NOT attention-getter as they should. Please let me know if you care about your desk? do you care what is on it and how the office is arranged? and also please think about managing multiple stores, how do you know what store you are operating? If for example shoes store you have brown colors theme, for flowers store you have green will not be much easier?